We use only real, whole (and delicious) ingredients. Learn about where they’re sourced, how they’re prepared, and way more than you ever wanted to know about each and every one at our ingredients page. Soya Beans, Sunflower Oil, Stabiliser: Calcium Sulphate, Tomatoes, Onions, Water, Green Peppers, Red Peppers, Tomato Paste, Red Wine Vinegar, Salt, Chipotle Paste [Water, Jalapeno, Rapeseed Oil, Garlic, Cumin, Arbol Chilli, Hickory-Smoke Powder, Black Pepper, Oregano, Modified Maize Starch, Cumin, Garlic Puree, Sweet Smoked Paprika, Oregano. A portion of the black beans we use are produced organically. In 2013, we used 4,800,000 lbs of organic black beans. A portion of the pinto beans we use are produced organically. 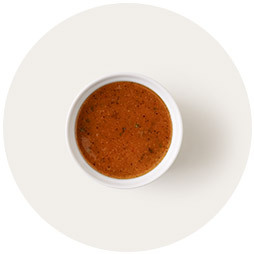 In 2013, we used 2,200,000 lbs of organic pinto beans. The cheesemakers that supply our cheese do not use animal-based rennet. As a result, the cheese we serve is suitable for vegetarians. 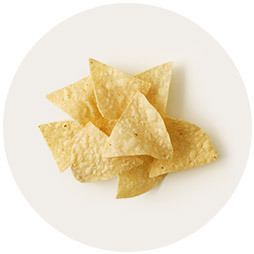 We use non-GMO white sweet corn in our Roasted Chili-Corn Salsa. 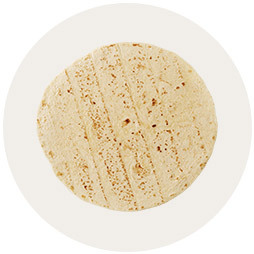 To produce tortillas according to the centuries-old process of Nixtamalization, corn is soaked in a lime solution. This practice, which has been followed in Mexico since before the days of Christopher Columbus, improves the flavor and increases the nutritional value of the corn. 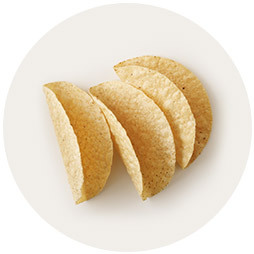 We fry our chips and crispy corn tortillas in non-GMO sunflower oil. Propionic Acid is used as a preservative, as it inhibits the growth of mold and bacteria. 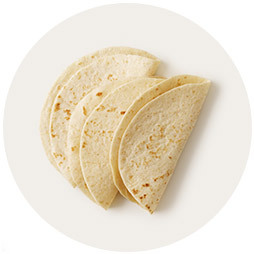 Benzoic Acid is used to preserve the freshness of tortillas by inhibiting the growth of mold, yeast, and some bacteria. Monocalcium Phosphate, a common ingredient in baking powder, is used as a leavening agent. Used as a dough conditioner in baking powder, fumaric acid helps improve the texture and pliability of dough. 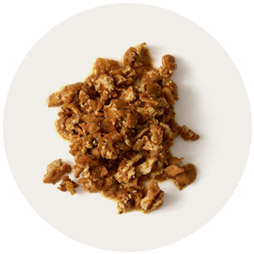 Calcium sulfate is a naturally occurring mineral that has been used as a coagulant in the tofu-making process for more than 2,000 years.